Though it's late making it to the blog, we posted about this on our Facebook page back in April... We have added another wonderful reader to our Lifetime Subscription list as a way of thanking her for the love and devotion she expressed for our books. 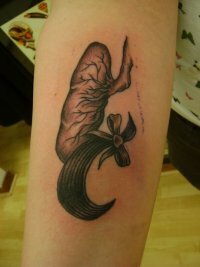 The above is a tattoo of a Lung and a Haircut, from a poem by the same title in Zachary Schomburg's Scary, No Scary, that Joy I. got on her forearm back in April. Just a reminder: if anyone else out there wants to get a tattoo inspired by any of our books, our offer for a free lifetime subscrpition to future books still stands. See the original post about this for details.